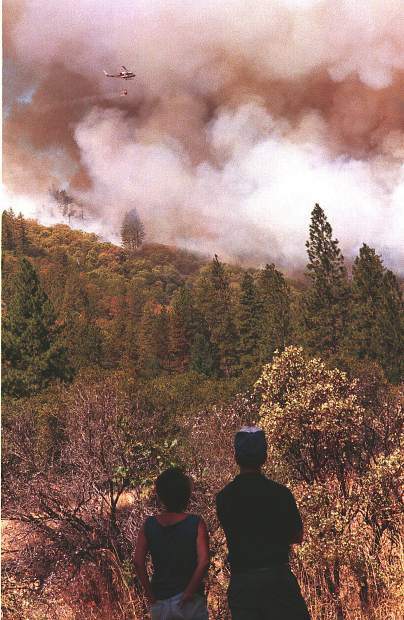 A couple watches the 49er Fire burn near Highway 49 and Reeder Ranch area, shortly after the fire broke out on Sept. 11, 1988. A fire engine burned during the 49er Fire, when it wrapped around West Wildwood Drive, near Lake Wildwood. 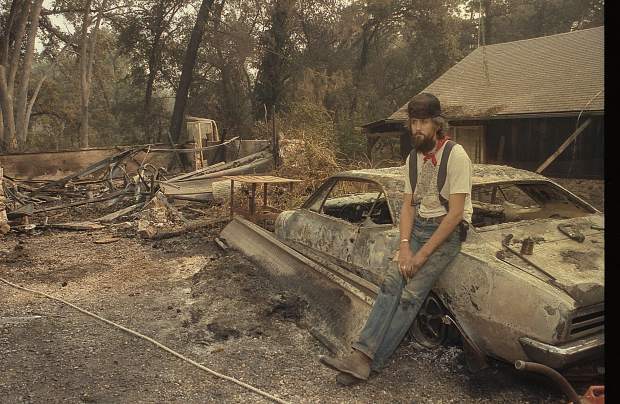 More than 300 structures, including many homes, burned to the ground during the 49er Fire in western Nevada County. A Sacramento TV news truck surveys the scene of several homes that burned to ground. 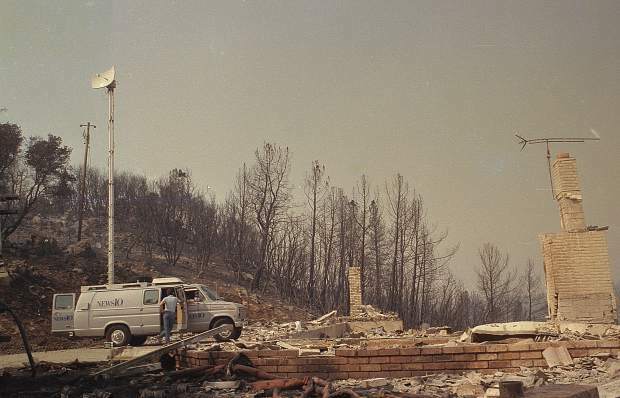 One of several homes destroyed by the 49er Fire in 1988. 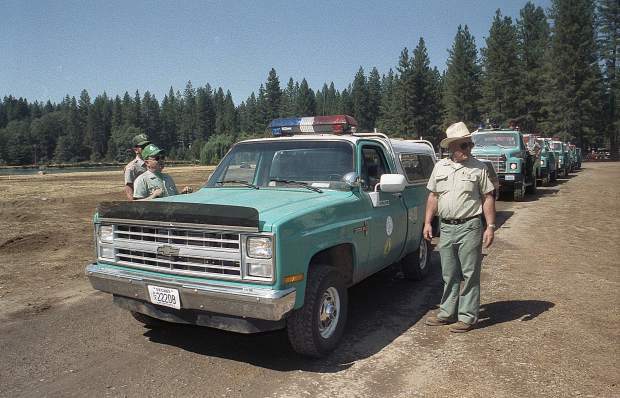 Nevada state fire personnel wait to depart the Nevada Country during the 49er Fire in September 1988. 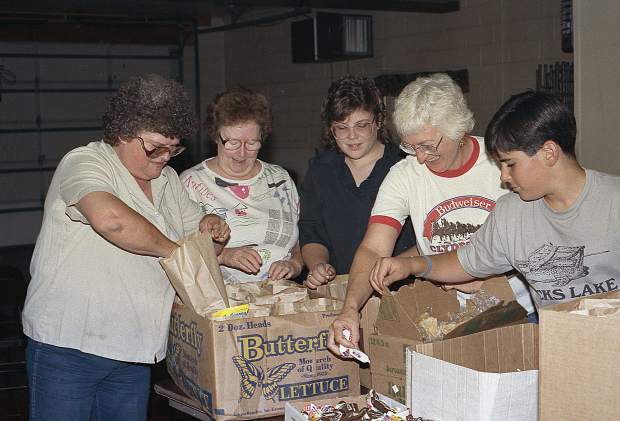 Community members make sack lunches for firefighters. Flames flicker above a ridge amid clouds of smoke from the 1988 49er Fire. 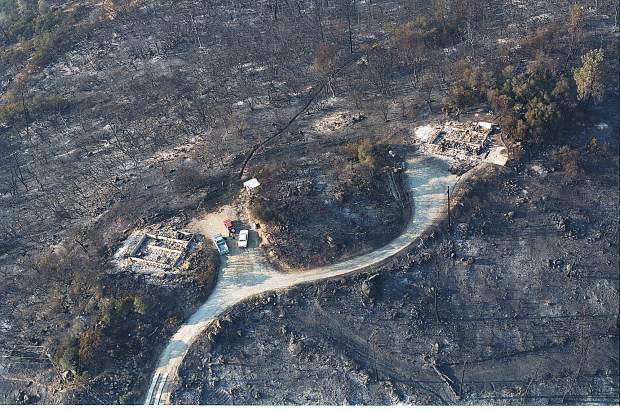 Sites of homes destroyed in the 49er Fire. 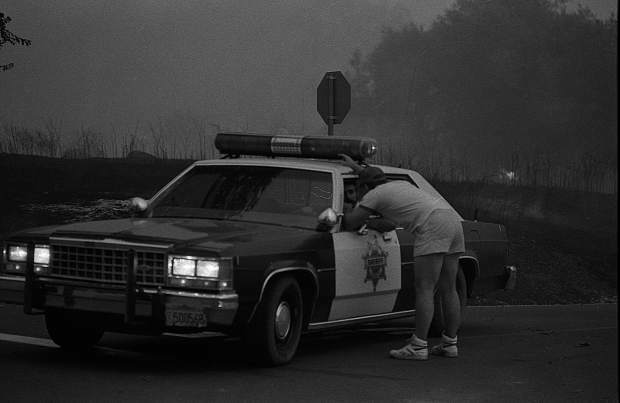 A resident talks with Nevada County Sheriff's Office deputies as firefighters battle the 49er Fire. Flames from the 49er Fire burn through a hillside. 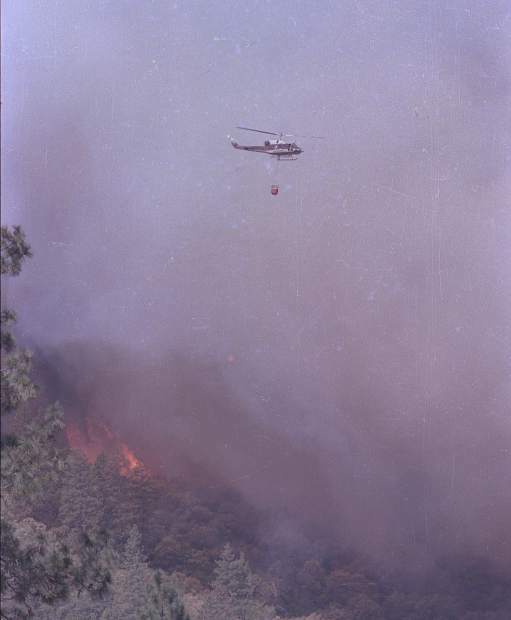 A helicopter dumps water on the 49er Fire in September 1988. Heavy smoke clouds the scene of the 49er Fire near Bitney Springs Road. 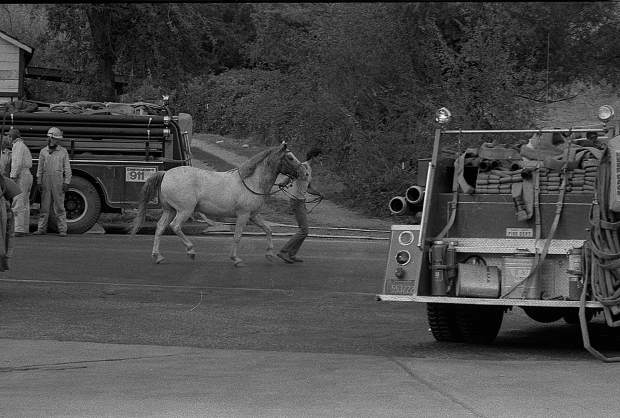 A resident evacuates a horse from property in Rough and Ready during the 49er Fire. 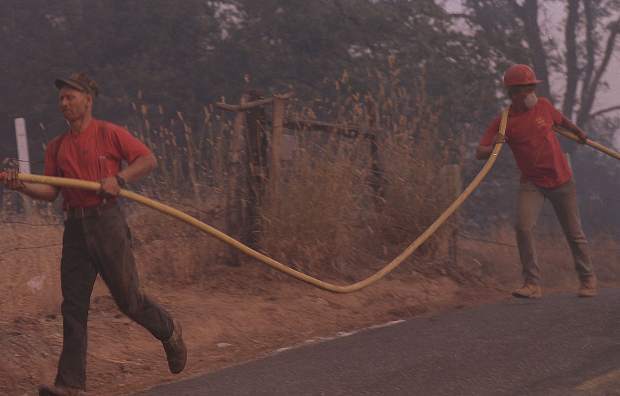 Residents help carry hose during the 49er Fire. 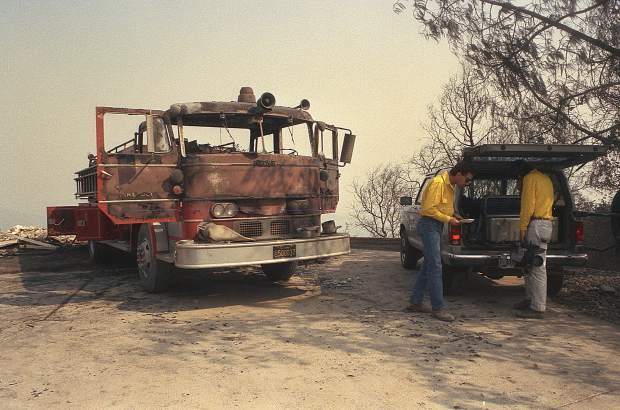 Firefighters unload hose in Rough and Ready during the 49er Fire in September 1988. A pair of firefighters take a break during the 49er Fire. 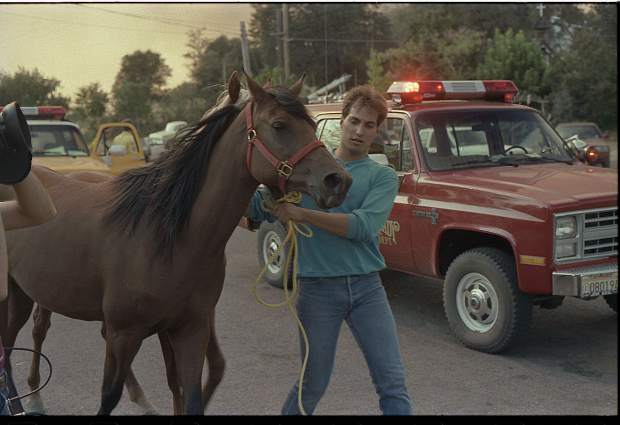 Residents help rescue horses in the Rough and Ready area during the 49er Fire in 1988. 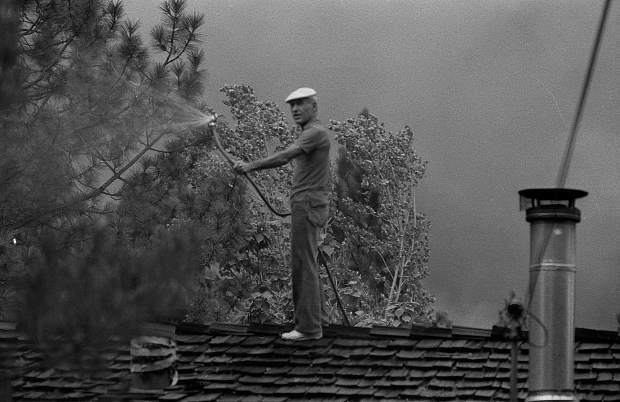 A Lake Wildwood resident sprays water on the roof his home during the 49er Fire in September 1988. 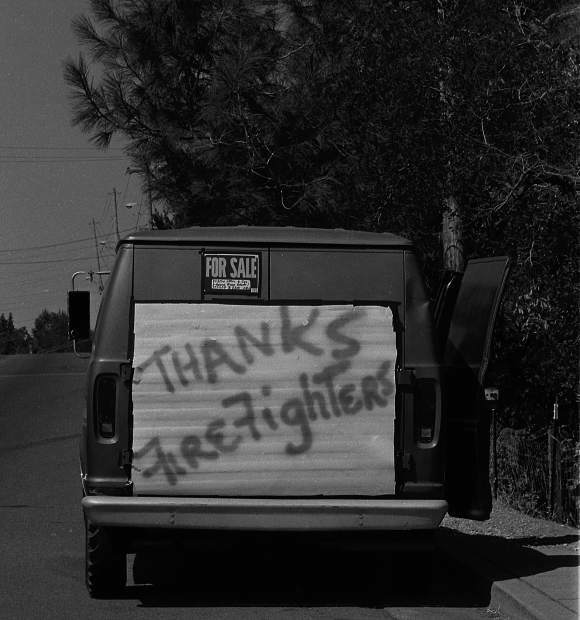 Residents leave a message of support for firefighters on the 1988 49er Fire. 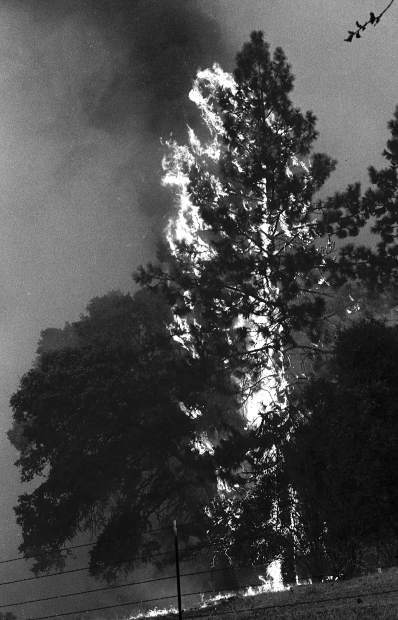 A tree goes up in flames during the 49er Fire. 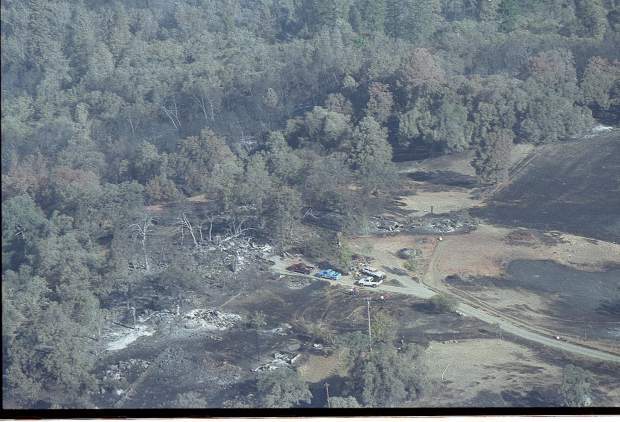 The site of a home destroyed during the 49er Fire. 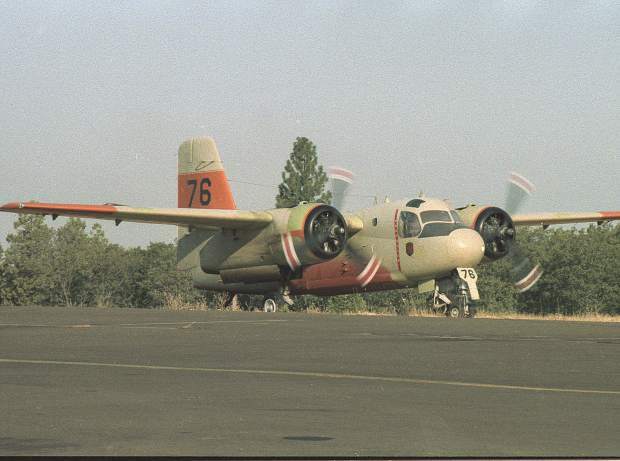 An air tanker returns to Grass Valley Air Attack Base during the 49er Fire. 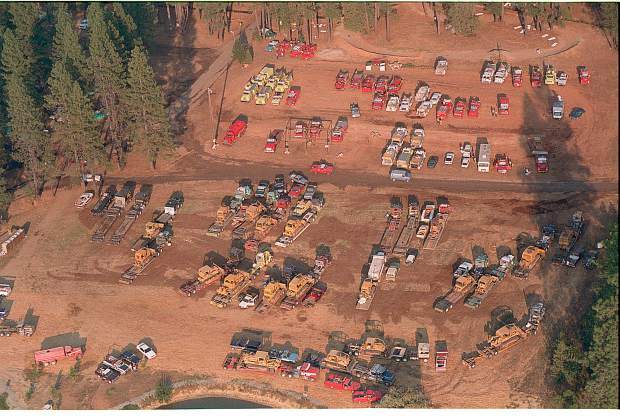 Equipment awaits deployment at the Cal Fire staging area at the Nevada County Fairgrounds during the 49er Fire in September of 1988. Marty Nelson was just 19 when, as a California Youth Authority inmate at Washington Ridge, he was assigned to fight what became the 49er Fire. A Sacramento native, he had been on the fire crew almost two years by then and had fought several fires. But nothing could have prepared him for that fire, he said. In the last few years, California has seen some devastating mega-wildfires. 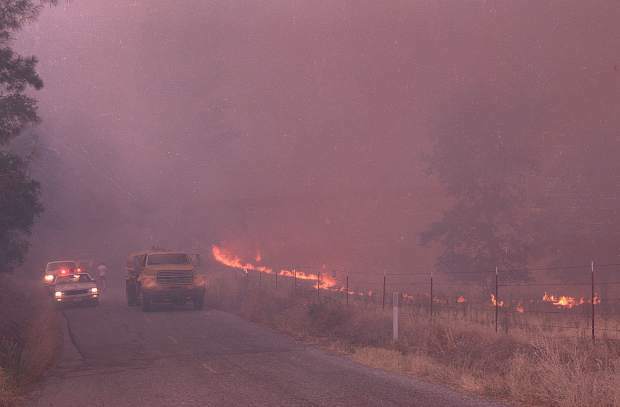 But 30 years ago, when the 49er Fire swept through Nevada County, few in Northern California had ever seen that kind of wind-whipped mass destruction. 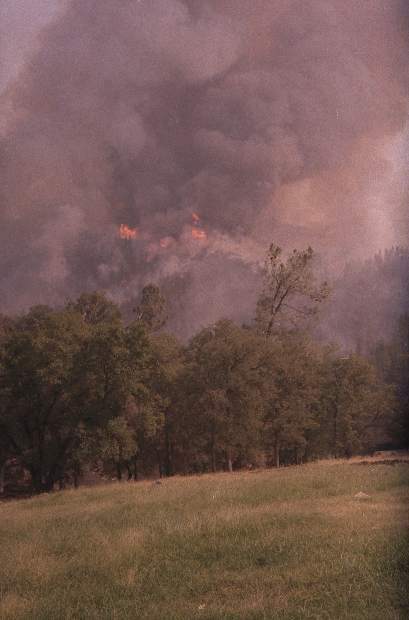 The 49er Fire started a little after 9 a.m. on Sept. 11, 1988. By the time it was contained on Sept. 13, it had burned 33,700 acres — 52 square miles — and destroyed 312 structures, 89 vehicles and 17 boats. 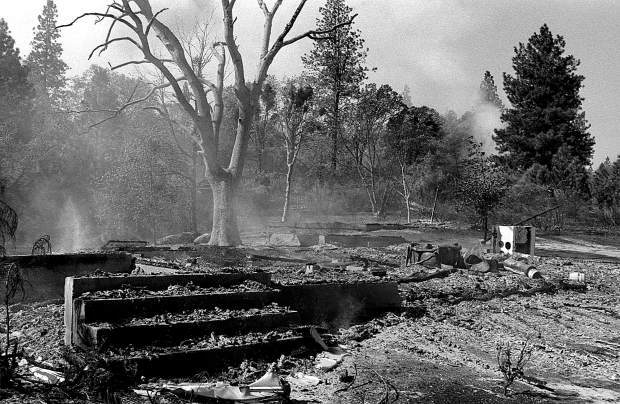 The memories still loom large for many in Nevada County, especially for those who fought the fire. What he remembers most clearly was the noise the fire made. Nelson remained at Washington Ridge another eight months before his release, then moved out of state. 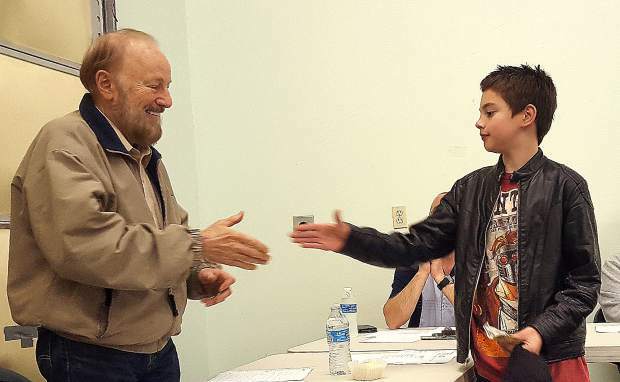 When he returned to California a few years ago, he chose to make Nevada County his home. Even veteran firefighters were stunned by the speed and ferocity of the blaze. 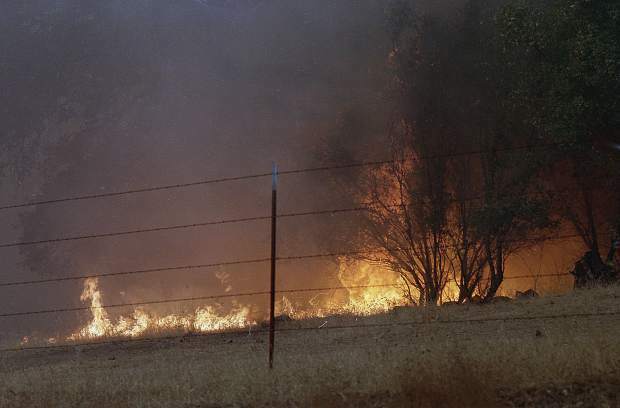 The heat and the wind already were a concern that morning, said Tony Clarabut, a battalion chief with California Department of Forestry at the time. After all, he said, firefighters had to knock down a 35-acre fire the night before. He was sitting with Capt. Gary Sweet, a longtime county resident and firefighter, when Sweet made a prediction. 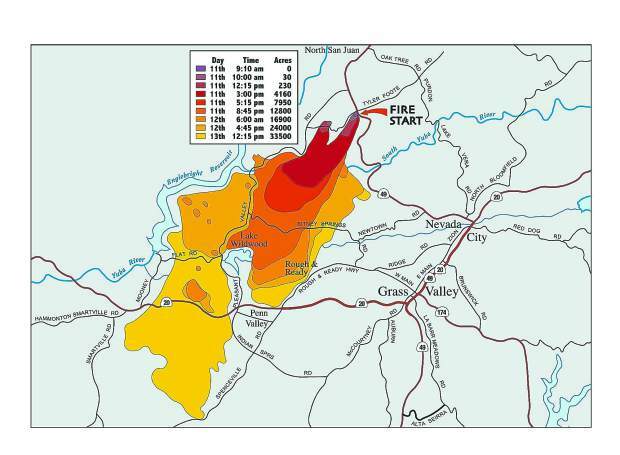 As soon as they got the quarter-acre fire under control, Clarabut said, they heard the Oregon Peak Lookout calling fire traffic in the North San Juan area. “That was the beginning,” he said. Clarabut was the first chief officer on scene, arriving after a North San Juan engine and a CDF fire engine. 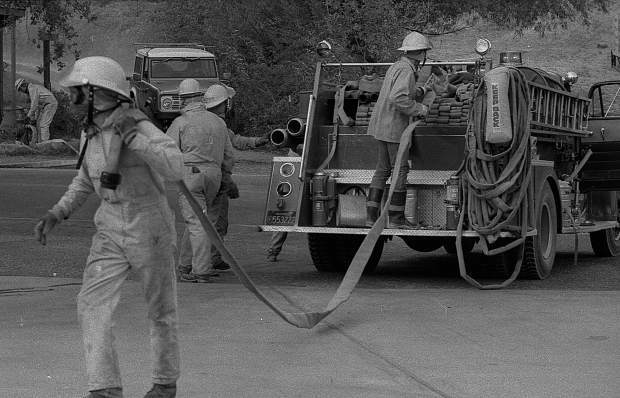 Back then, a vacuum of fresh resources led to many of the firefighters working 48 hours or more before getting a rest. “When you’re in the thick of things, even a catnap is not happening,” Clarabut said. 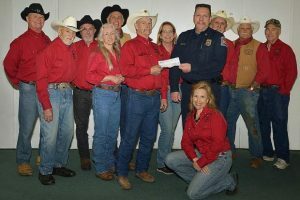 “One interesting comparison … is that 30 years down the line, fire agencies do a lot of things better, there’s more coordination of resources and more mutual support, and more resources, more personnel available,” Clarabut mused, adding that a number of the fire stations back then weren’t staffed with paid personnel. Another change for the better? 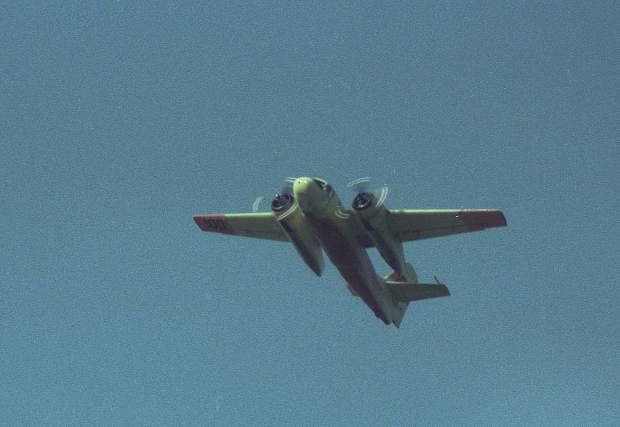 During the 49er Fire, Clarabut said, the Lake Wildwood evacuation was a “disaster,” with residents who were trying to flee the fire getting stuck in long lines. One major issue in 1988? A lack of defensible space. According to the Fire Safe Council of Nevada County, of the 148 homes destroyed during the 49er Fire, 80 percent were not in compliance with the required clearance around homes. 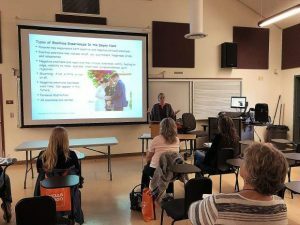 This is an issue that has not gone away, Clarabut said — and is one that gets ever more important as the county’s population has continued to grow. And, Clarabut said, the more homes get built in the wilderness, the more the responsibility for protecting homes becomes a greater and greater burden on the local fire agencies. In much of California, he said, residents aren’t getting the message to be good stewards of their land and manage the fuels. 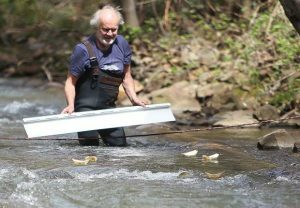 “Driving around Nevada County, to our credit, a lot of people are making a better effort to clear their land,” Clarabut said.